Heat oven to 375°F. 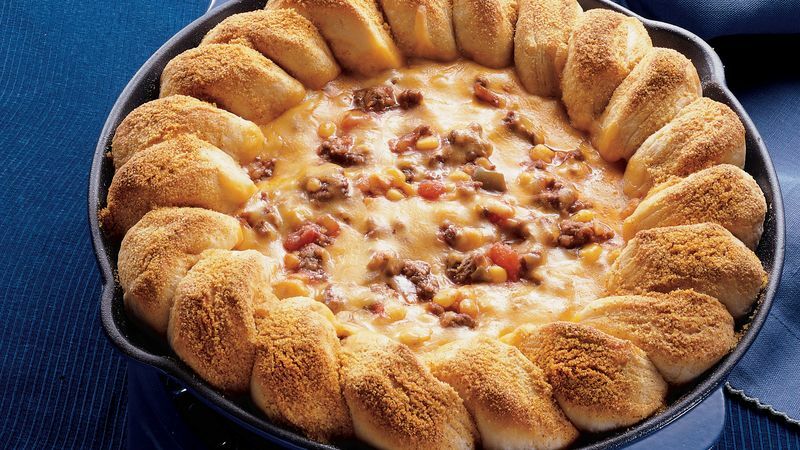 In large ovenproof skillet, brown ground beef and onion until thoroughly cooked. Drain. Stir in all remaining beef mixture ingredients. Bring to a boil. Reduce heat to low; simmer 10 to 15 minutes or until most of liquid is absorbed. Meanwhile, in small bowl, combine cornmeal, paprika and 1/8 teaspoon garlic powder; mix well. Separate dough into 10 biscuits. Cut each in half crosswise. Arrange biscuits, cut side down, around outer edge of hot beef mixture. Brush biscuits with margarine; sprinkle with cornmeal mixture. Sprinkle cheese in center over beef mixture.